Sad Lad and the Mourners was a band that formed in the 1960's. 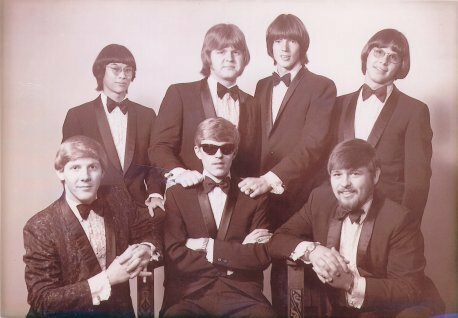 After some personnel changes a more permanent lineup consisted of college students Willie Bertsch (vocals), Gary Swanson (drums), Ken Huseboe (trumpet), Sam Hasegawa (sax), Rod Anderson (guitar), Al Christoperson (bass), and high school senior Gerry Moore (keyboards). They were booked by R & G Enterprises (Reg Gacke) out of Brandon, SD. They toured throughout the Midwest, playing R & B and soon gaining a reputation as one of the premier horn bands in the area. Gacke saw the potential in the group so he recruited 2009 SDHOF inductee Bill Van Dusen to make an audition tape of the group at the Dells Ballroom. They sent it to James Reardon and Associates out of Hayes, KS. Reardon was so impressed with the tape that he came up to Sioux Falls for a personal audition. Kansas was famous for its successful horn bands (Flippers, Red Dogs, Rising Sons) and Reardon was involved with a group, the Apostles, that had just broken up. He signed the group but changed their name to the Fabulous Apostles, thus taking the place of his previous band. The tuxedo wearing Apostles became an instant success and part of the "family" of KOMA bands that also included Spider and the Crabs, Young Raiders, and the Smoke Ring. Most of these bands were out of Oklahoma and Kansas. It wasn't uncommon for the groups to draw over 1,000 fans for a dance. In 1968 the Apostles won a "Battle of the Bands' ramp dance in Sioux Falls attended by an estimated 10,000 spectators. Their popularity continued to grow and they developed a huge following in the Midwest. They played all the big ballrooms including the Roof Garden, Surf, Hollyhock, Showboat, Milltown, Groveland Park, Rest Haven, Arkota, Ruskin Park, and many more. Willie Bertsch and Sam Hasegawa are still playing music as the "Apostles Jazz Standards Band" in the Sioux Falls and surrounding area. They are in demand of private parties, dinner clubs, and corporate parties. They will go down in history as one of the first and most popular horn bands in South Dakota.